These four Neomartyrs were Athonite monks from the Monastery of Konstamonitou. The year 1821 marked the first year of the Greek Revolution, at which time many Greeks were killed. Some of these were Martyrs, having died for their testimony of faith in Christ. In 1821 Abdul Abud was the Pasha of Thessaloniki, who persecuted the Christians and Athonite monks at the time. We received the following information from the biographer Monk Dositheos Konstamonites, who compiled the lives of various Neomartyrs. Synesios was from Trigleia in Asia Minor. He arrived at the Holy Mountain at a young age, first in Iveron Monastery, where his brother Theophilos and uncle Gerasimos were living as monks, then Konstamonitou Monastery, where he was tonsured a monk. 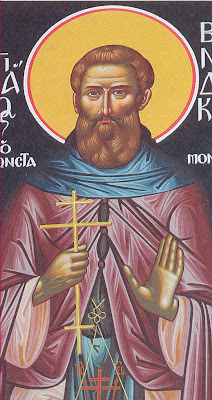 During the Revolution of 1821 he was taken by Turks together with other monks of the Holy Mountain, as well as the administrator of the Holy Mountain Spandoni, to Thessaloniki, and they were tortured in order to reveal hidden treasures from the monasteries, which according to sources were supposedly being held at the Metochion of Monoxylites. They remained in prison for two and half years, and all perished therein, including Synesios, due to the ill treatment, torments and deprivations of life in prison, in the year 1824. 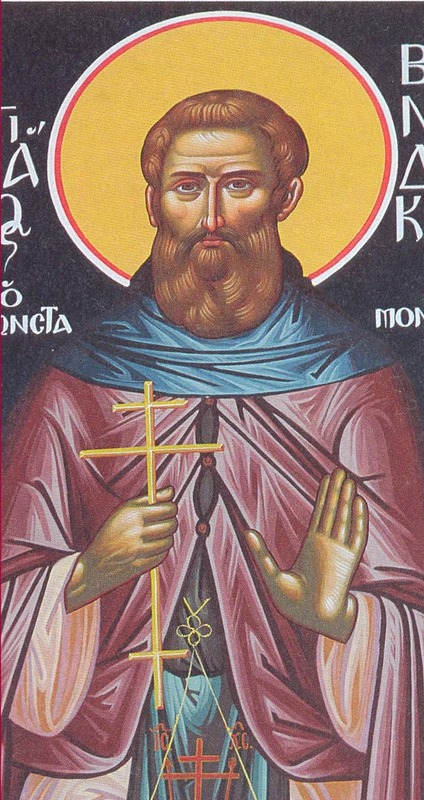 Benedict was from the village of Daphne in Serres, where a metochion of Konstamonitou Monastery was located, and he became a monk with his father naturally at Konstamonitou Monastery. Initially the father went and was tonsured a monk, but due to the young age of Benedict he was sent to be educated at Polygyros, after which he went to the monastery and became a monk then a presbyter. During the Revolution he was arrested at a metochion of the monastery in Kalamaria near Thessaloniki. After suffering tortures with other monks and laypeople, he was put to death by beheading on June 12, 1821. After his martyrdom a luminous cross shone over his body. When Turkish soldiers informed the Christians of this, they were given permission to bury him. 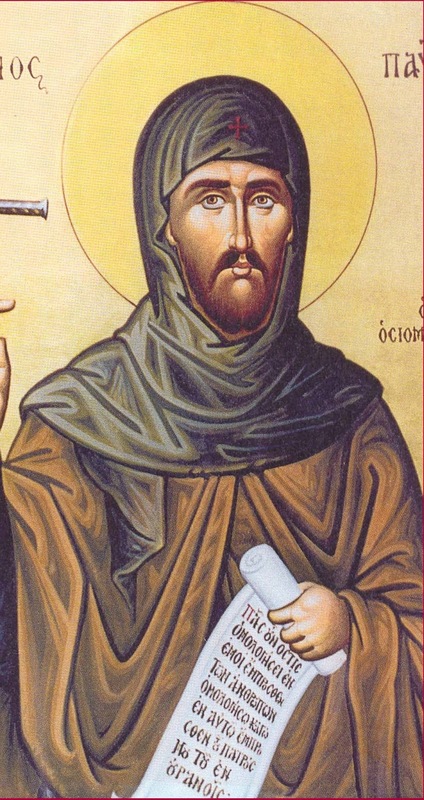 Timothy was from Beroia, and was initially married, but after the death of his spouse he went to become a monk at Konstamonitou Monastery. He was martyred during the Revolution when he was over sixty years old in 1822. Paul was from Ioannina, whose father died when he was a young child and he was raised with care by his mother. There he received a well rounded education from Kosmas Balanos, the founder and head of the Gouma School. From a young age he was pious and loved to attend the divine services either at the Church of Saint John in Bounila or at the Panagia Peribleptos. One day Abbot Chrysanthos of Konstamonitou Monastery together with the New Martyr Benedict visited Ioannina for business of the monastery. 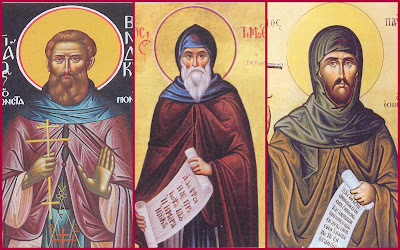 There the young Peter, which was Paul's name before being tonsured a monk, met the Abbot and followed him back to the Holy Mountain, where he was tonsured a monk and given the name Paul. He also suffered in prison in Thessaloniki during the Revolution with other monks. He was noted for continuously praying: "Lord Jesus Christ, have mercy on me," and "Most Holy Theotokos, help us." There he died at the age of thirty in 1824. 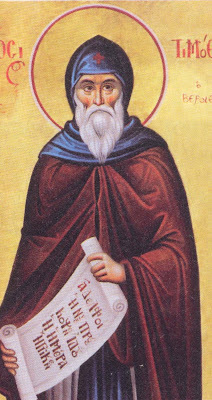 Divine offspring, of Trigleia, joyfully practicing asceticism, at the Holy Mountain, Venerable Martyr of the Lord Synesios, having accomplished martyrdom in the stadium, you were made worthy of the brilliance of martyrdom, wherefore intercede, that we who praise you may receive, propitiation for our failures and great mercy.